This was much more successful, although i slightly overcooked it, so it was nice and chewy as nigella says it should be, but perhaps 10 mins per mouthful is a bit much even for toffee lover! I exaggerate of course, but i should still have listened to tara when she told me it looked done. But being faithful to nigella, i gave it another 5 mins. Nigella and her cooking times - what can i say! - Make the pastry as before, using 100g plain flour, 50g butter, a few tablespoons iced water and 2 tablespoons lemon juice, but leaving out the icing sugar. - Roll out to line a 20cm flan dish and put in the fridge for 30mins. - Heat 225g golden syrup in a pan and when runny, add 60g white breadcrumbs and the zest and juice of 1/2 lemon. 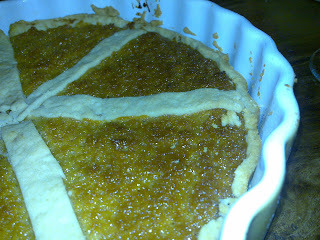 - After 5 mins, stir in 3 tablespoons double cream and add the mixture to the pastry case. - Cook for 25-30 mins at 180C (nigella says 15 mins at 200C then 15 mins at 180C). It was delicious and would have gone great with vanilla ice cream, but the freezer was broken at merula, so no ice cream for us.